I will just make a prediction and try to keep out of the swamp of Trump-obsession as the weeks unfold. 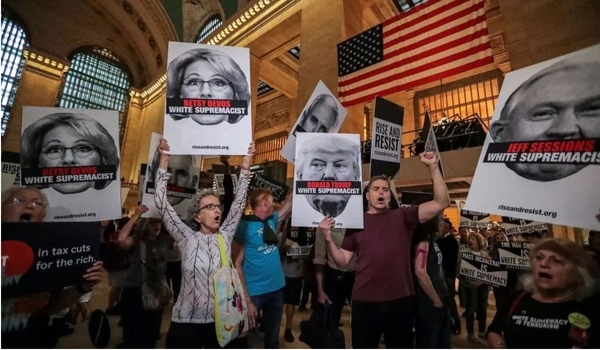 The anti-Trump movement is now in inexorable decline; it is a little like the Nixon defense forces after the Saturday Night drama in October 1973, with the departure of the attorney general, his deputy, and the special prosecutor, though Mr. Nixon had broken no laws. Nearly a year ago, as President and Mrs. Trump and their entourage departed for the Middle East, the Vatican, and a NATO meeting, David Gergen, a fair and fine man intermittently rendered delirious by the swamp mosquitoes at CNN, said, "We are moving into impeachment country." This was after the firing of James Comey as FBI director. Nate Silver of ABC said the chances of impeachment of Mr. Trump were from 25% to 50%. Almost a year on, Mr. Comey's deputy has been fired on the recommendation of the Department of Justice inspector general and the FBI's Office of Professional Responsibility, and he and Mr. Comey are accusing each other of untruths ("lack of candor," in their genteel parlance). Many high FBI officials have been demoted, and Mr. Comey, as if he inhabits a planet of different perceptions, has embarked on a book tour that is the most spectacular suicide mission since the final voyage of history's largest battleship, the 73,000-ton Japanese Yamato. Without air cover, it set out to attack the American invasion of Okinawa. Yamato was swarmed and sunk by 360 American naval aircraft, and went to the bottom with the loss of over 3,000 Japanese sailors, having shot down about six American aircraft. Every interview Mr. Comey has had, in what was billed by his supporters at the outset as a challenge to the president's command of press attention, has been more disastrous and self-contradictory than the preceding one. There must be millions more Americans every week who ask themselves how this vain, pretentious, and chronically moralizing hypocrite was ever set at the head of the nation's federal police. The Russian-collusion narrative has collapsed. The silence of Trump-Hateville is deafening. On to outrageous seizures of the papers of one of Mr. Trump's lawyers, who has attracted attention because of the alleged consensual and genial — even if mutually unexciting – evening together of a peppy but raddled woman and the billionaire who would, a decade later, be elected president. And, in a particularly ludicrous effort to catch the fumbled and bouncing football, the Democratic party has sued the Russian government and the president's elder sons (young Barron is spared that, if little else). These are the pathetic thrashings of denial of people who feloniously corrupted the fragile American justice apparatus in the interests of continued incumbency. Ten times as much press attention is given to the unlikely scenario that the president's supposed fixer and lawyer, Michael Cohen, will "flip" — to assist Mueller in finding something illegal in Trump's past — than is paid to the notion that fired FBI deputy director Andrew McCabe, who, unlike Mr. Cohen, is facing serious charges, might "flip" against his former boss Mr. Comey. Mr. Comey is going to have a bumpy legal sleigh-ride whatever Mr. McCabe does, and on his book and its tour and congressional testimony alone is already an evidentiary pretzel. As a former theology student, he will be invoking supernatural assistance to extract himself from this self-strangulating web of misfeasance and indiscretion. In her book about the election, Hillary Clinton accused Donald Trump of having won the election because of the intervention of Mr. Comey and because of Mr. Trump's treason with Russia, citing the fraudulent dossier that even Mr. Comey and Bob Woodward dismissed, without mentioning the fact that inevitably emerged just a few weeks later that the Clinton campaign and the Democratic National Committee had paid for the dossier. So immense and intoxicating was the world of malicious make-believe the Clinton–Obama Democrats had confected, with the benign neutrality of the Bushies of all generations of that perennial family, that they are just beginning to realize how immense is their peril and potential for self-destruction. If they had just taken their lumps and made the normal billings and cooings on defeat, Mr. Trump would never have bothered them. By endlessly poking the victor, unleashing their press parrots, and screaming of treason, they have encouraged precisely the qualities of President Trump which most irritate his enemies, and many politically neutral and tasteful people as well. They have roused a monster, and as Admiral Yamamoto, architect of Japan's tactical victory at Pearl Harbor famously said, "filled him with a terrible resolve, which will shortly be turned upon" them. President Trump would not have bothered them if they had not pursued this defamatory idiocy of Russian collusion and treason. All of them will face the grand jury, rubber stamps for prosecutors, who will not be auditioning for Democratic gubernatorial nominations or even for places in the big Democratic law firms. Their inability to accept the people's verdict made their late opponent more like the nasty caricature they claimed he was, but provoked him and his supporters to tear the mask off their institutional, financial, and media corruption, all of which he would have been happy to forego, if they had allowed him to be the customary generous post-electoral figure of national reconciliation Americans have come to expect of incoming presidents on a political honeymoon. They sowed, and they shall reap, and the harvest will disgrace and destroy them. Before it is over, even the slab-faced incarnation of sanctimony, Robert Mueller, will be doing a tap dance explaining his role in the Boston FBI scandal, the anthrax fiasco, and the Clintons' clinging Uranium One controversy. Now, finally, I wish to promote a very positive move. The well-known New York hedge-fund manager Marc Sole told me that the president tweeted on the weekend that Sylvester Stallone had recommended to him the posthumous pardon of heavyweight boxing champion Jack Johnson. Of course that is a good idea, but it is a door-opener to a brilliant benign initiative. Instead of this nasty, violent destructiveness, this revisionist iconoclasm that tears down statues to the valor of the hundreds of thousands of the brave sons of the Confederacy who died for a bad cause, but one, as otherwise exemplary Americans, they believed in, and removes statues to their mainly rather distinguished leaders, especially the great General Robert E. Lee — we should formally resurrect the wronged dead. Here is a noble cause. Without a whiff of political correctness, much less of political faddishness, let us have a commission of distinguished historians and jurists and eminent civic figures deliberate the posthumous pardon of a great range of questionably convicted people. I am not referring to infamous murder cases like that of Sacco and Vanzetti (who were probably guilty but should not have been executed — and neither should anyone else be), or to the Rosenbergs. Nor should this become a flytrap for past causes célèbres like Alger Hiss. Rather, let this commission look at cases of evident and timeless injustice: John Brown was guilty of insurrection (in an admirable cause the nation shortly legitimized) but not of capital crimes, as no one was killed by him or his followers. Colonel Billy Mitchell's court martial in his championship of airpower should be reversed (only General Douglas MacArthur voted to exonerate him). We don't need to reopen the Lindbergh kidnapping and murder, or make this a court of historical appeal for everyone who has ever been found guilty of a serious offense. This commission should have a mandate to investigate cases of prominent people (for which there will have to be some sort of definition) who have possibly been unjustly convicted, and great indicative cases that have produced evidently unjust verdicts for discreditable and not legal reasons, such as the racist infamy of Dred Scott. Instead of trying to expunge facts and erase great figures of American history, the country should spread the concept of posthumous reward, as in the Congressional Medal of Honor (including President Clinton's award of it almost a century after the relevant facts to President Theodore Roosevelt). Such a move could rekindle interest in American history and put everyone, right and left, to the task of studying the history of the United States, and particularly its strong but inconstant sense of justice. Let us have more statues, and more candidates for statues, even with modified inscriptions. This is a cause all can embrace and take the country's attention, a little, away from the coming degradation of Trumpophobic extremists.